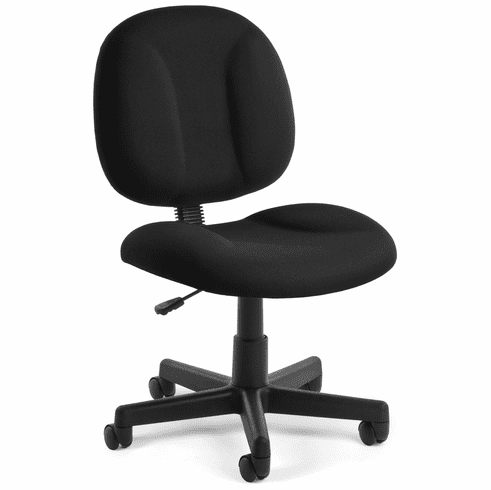 This task chair from OFM features an extra-wide seat for comfort, 750,000 double-rub fabric rating, Teflon guarded, stain resistant fabric, hi-density foam padding on both the seat and back, ergonomically sculptured cushions, back depth and height adjustments, gas lift seat height adjustment and optional adjustable height "T" style arms. Additional options like soft wheel casters for hardwood floors or fixed glides (keep a chair solidly in place) are available for a minimal charge. 250 lb. weight capacity. This chair meets or exceeds ANSI/BIFMA standards. Dimensions: Seat size: 21"W x 19"D. Back size: 19"W x 17.5"H Seat height adjustment: 18"-22"H. Limited lifetime warranty from OFM. These OFM office task chairs normally ship within 1-2 business days from our NC or AZ warehouse.